Kings Bridge Park - Just 5 minutes upstream from the Falls is King's Bridge Park, by the former village of Chippawa. This spot is a favorite all summer long with . . . Parking is $10 during the summer. Chippawa Creek is a popular local swimming area but beware of the strong current. Strong swimmers only. It is here that the Niagara River and Welland River meet. Chippawa was a thriving commercial center at the turn of the century. Ships could unload and have their cargo moved overland and then loaded on other vessels at Niagara-on -the -Lake. They then continued through Lake Ontario through the St Lawrence eventually to the Atlantic Ocean. That all ended with the building of the Welland Canal. 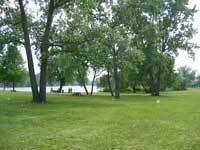 Chippawa now is a desired residential area with a thriving tourist area.